Boxtales Theatre Company is unique in a number of ways. First, they perform only original works based on mythology and folk stories. Second, their physical approach combines mime, acrobatics, juggling, dance, Brazilian capoeira, and live music. Next are the masks and puppetry, strange and wonderful artifacts constructed especially for the troupe. Finally, their pared-down approach balances the spectacle of theater with the intimacy of storytelling. Although based in Santa Barbara, Boxtales is in fact a touring professional company, serving surrounding cities, the Bay Area and even Olympia, Washington. 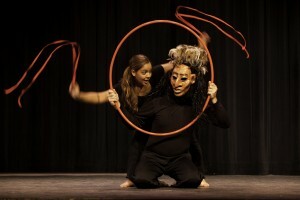 In celebration of their 20th anniversary, Boxtales will return to the Lobero Theatre to stage four newly upgraded shows from their repertory this weekend: Prince Rama and the Monkey King, The Odyssey, Leyendas De Duende: Magical Tales from Latin America, and B’Rer Rabbit and Other Trickster Tales. I recently caught up with Andrews, and company principals Matthew Tavianini and Marie Ponce to discuss the big milestone. This entry was posted in DirecTalk Podcast and tagged Boxtales Theatre, Lobero Theatre, Marie Ponce, Matthew Tavianini, Michael Andrews, mythology on November 11, 2014 by joemiller.